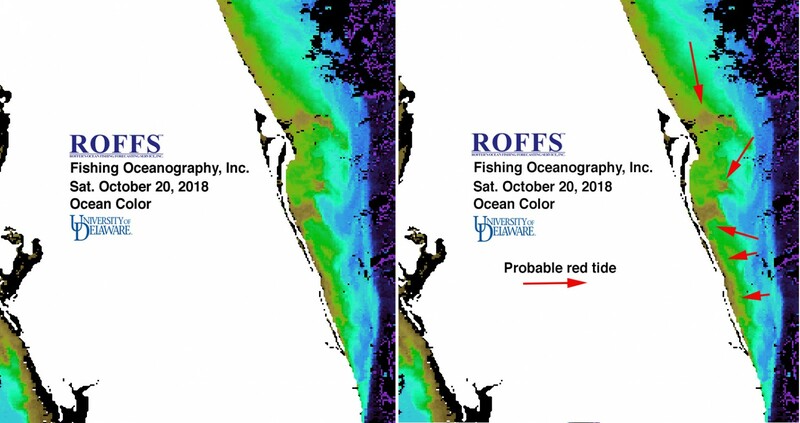 Below is NASA ocean color MODIS/VIIRS imagery provided by ROFFS™ and University of Delaware, with assistance from Mitchell Roffer (ROFFS™ Consultant) from Saturday October 20, 2018. There appears to be a big pool of red tide off Melbourne with additional pools off Cape Canaveral, Cocoa and Melbourne south to Fort Pierce with some additional to Port St Lucie. We are uncertain about the apparent pool off Cape Canaveral, but have heard that red tide has been found off Ponce Inlet, so there is a good chance that the pool off Cape Canaveral is red tide. 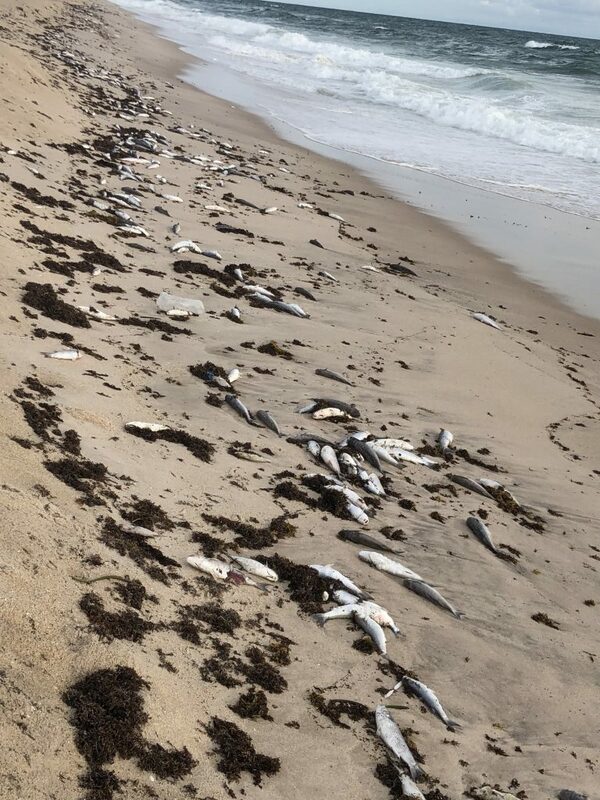 Also, there has been a substantial amount of dead fish washing onto Cocoa Beach that may have originated from this pool since the main mass is off Melbourne Beach. However, without microscopic examination or the discovery of acrid aerosol one can not determine that this is red tide. Another reason for more ocean observing and sampling, as well as, modernizing the coastal ocean buoys to include biological sampling. We had originally observed this high chlorophyll water from Port St. Lucie on October 8th and northward to Vero Beach and even further northward to Brevard County. Thousands of fish have died and continue to wash up on the beach. Many people continue to call this a natural event, which it is, but forget to say its super fueled by man-made nutrients allowed to enter the waterways by weak water quality regulations that go mostly unenforced, with very limited inadequate monitoring with little personal and corporate responsibility. When studying older satellite imagery from October 5th to the 12th, 2018 we were able to easily see a pulse of very high chlorophyll water (brown) coming from Port St. Lucie inlet area and moving northward. We also followed a filament of Gulf Stream water that went by at approximately the same time. 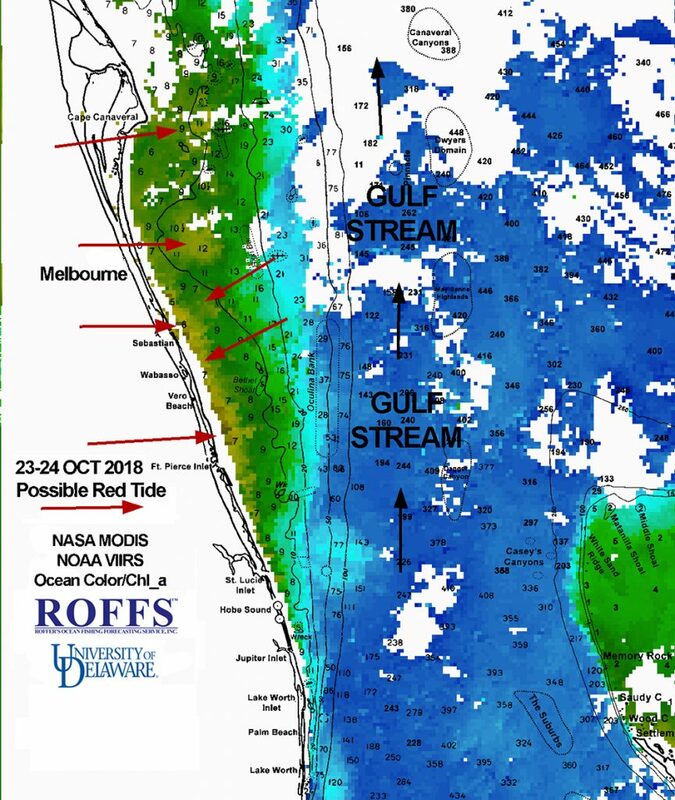 This means that either the red tide and nutrients came from Port St. Lucie inlet, or that a combination of very high nutrient water fertilized the red tide organisms coming up the western side of the Gulf Stream causing this event. Exactly which can not be determined without sampling both the Port St. Lucie area and the Gulf Stream and conducting a DNA-RNA analysis of the red tide (those here now and the red tide off the west coast of Florida). Thus, it appears that our current event on the east coast of Florida north of Port St. Lucie could easily be caused by seeding from either west coast/Gulf Stream or local red tide + nutrients from east coast water releases or red tide algae from the Port St. Lucie inlet area blooming and moving northward. The bloom that moved southward the week or two before from this area to Miami could easily be the same mechanism. Above: NASA ocean color MODIS/VIIRS imagery provided by ROFFS™ and University of Delaware from Saturday October 20, 2018. Above: Dead fish wash up on Melbourne Beach, FL on Wednesday October 24, 2018 likely as a result of the presence of red tide. Photo courtesy: Mitch Roffer.